To celebrate 10 years of the Arnage, 50 years of its mighty V8 engine and 90 years of the marque, Bentley Motors will launch its limited edition model at the Paris Motor Show late this week. o Bentley audio system: 1,100 W, 10 speakers and next-generation Digital Signal Processing (DSP) with 8 modes to provide the world’s best in-car sound stage. For the last ten years the Arnage’s combination of 'muscular' lines and understated luxury have endowed it with a commanding road presence synonymous with all Bentley Grand Tourers, subtly conveying the car’s formidable performance potential. This powerful exterior profile is underpinned by a torsionally stiff body shell (with an astonishing 6,500 spot welds) that helps to deliver outstanding ride and refinement. 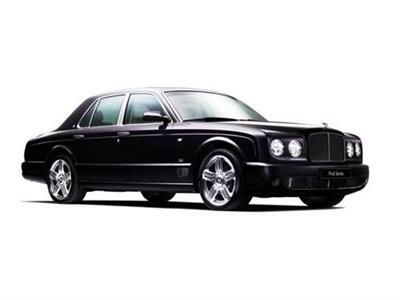 The Arnage Final Series is further distinguished by exterior design features first seen on the exclusive Bentley Brooklands coupe, comprising 20 inch five-spoke, two-piece alloy wheels and ‘Le Mans’ lower front wing air vents. Additional unique features include body-coloured front and rear lamp bezels, ‘jewel’ fuel filler cap (made from billet aluminium) together with ‘Final Series’ wing badges and polished stainless steel tread plates to the front doors. Many of the most desirable Mulliner options are included in Final Series as standard, most notably the hand-made waist rails with inset chrome strip with recessed Bentley badges, the new rear cabinet and document storage trimmed in hide, plus the beautifully designed picnic tables available in a choice of three premium unbleached wood veneers – all prime examples of Crewe craftsmanship. 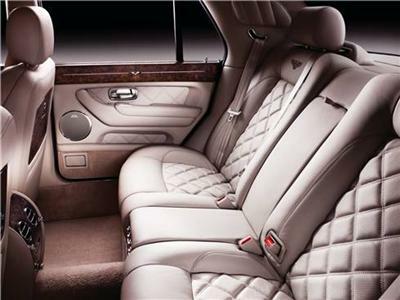 A set of mirror-matched veneers for each car takes 13 days to craft, while 17 hides and almost 400 separate pieces of leather are used for the upholstery, trim and headlining. Arnage Final Series spans the many eras between traditional coach building skills and 21st century high-performance automotive engineering. Arnage Final Series is available in the full Bentley range of 42 exterior colours, 25 interior hides, and three veneers, plus the comprehensive line-up of Mulliner options and its bespoke colour-matching service that enable Bentley owners to make a uniquely personal car. Naim for Bentley world class audio system – delivers the world’s best in-car sound stage. Provided in partnership with Bentley by Naim Audio, a UK-based high end hi-fi manufacturer, this system features 10 speakers, a dual channel sub-woofer and a 1,100 Watt amplifier – the world’s most powerful production unit fitted in a car. Bentley is also the first car manufacturer to use a next-generation Digital Signal Processor (DSP) in its audio system which features eight individual modes to reproduce true emotions and a ‘live’ concert-like experience. The engine, transmission, chassis and running gear of the Arnage Final Series are identical to those previously employed in Arnage T. In this specification, Bentley’s remarkable all-aluminium 6¾ litre V8 engine produces 500 bhp (507 PS/373 kW) and 1,000 Nm (738 lb ft) of torque – figures that ensure that the legendary Bentley ‘wave of torque’ delivers effortless performance for a unique driving experience. Acceleration to 60 mph is accomplished in 5.2 seconds (0-100 km/h in 5.5 secs) with 100 mph reached in 12.1 seconds (0-160 km/h in 12.0 seconds). Top speed of the Final Series is 179 mph/288 km/h. Each V8 engine bears the signature of the team leader who oversaw its hand-built construction in the Crewe factory. Significantly upgraded in 2007, the Arnage’s fully independent double wishbone front and rear suspension features coil springs with computer-controlled, adaptive electro-hydraulic dampers and automatic ride-height control with auto-load compensation. These endow the Arnage with impressive body control in all driving conditions, while the new five-spoke, two-piece 8.5J x 20-inch Sports alloy wheels with 255/40 ZR20 Pirelli P Zero tyres – originally developed for the Brooklands coupe - aid handling and road holding. As an option, Final Series may be specified with carbon/silicon carbide, cross-drilled brake discs. Measuring 420 x 40 mm (front) and 356 x 28 mm (rear), these discs are the largest fitted to any production car on sale today. With eight-piston callipers, the brakes provide impressive retardation and also give an 8 kg reduction in unsprung weight, benefiting steering response, ride suppleness and acceleration. In 1959 the power and torque of that first 6.23-litre 90-degree V8 engine in the Bentley S2 saloon was officially described as “adequate”. Actual output was around 200 bhp with 400 Nm of torque. Today, the Final Series 6¾ V8 produces 500 bhp and 1,000 Nm with over 90 percent of that torque available between 1,800 and 3,800 rev/min. In 1962 an increased compression ratio enhanced performance. Seven years later, for the Bentley T-series, the V8 engine underwent a far greater power boost with a longer stroke increasing capacity to 6¾ litres, where it remains to this day. The introduction of turbocharging in 1982 delivered an even more dramatic increase in power to 297 bhp to make the Bentley Mulsanne Turbo. The later introduction of port injection systems and a charge cooler for the turbo further improved performance. In 1999 the V8 engine was introduced into the Arnage, codenamed “F1”, with a single turbocharger, by now developing 400 bhp/298 kW and 616 lbft/835 Nm of torque. This was followed in 2002 by the “F6” version featuring twin turbochargers, boosting power to 450 bhp/336 kW with 645 lbft/875 Nm of torque. The V8 engine underwent perhaps its most extensive development in 2006 taking power to 500 bhp and torque to 1,000 Nm. The introduction of two low-inertia, quick-reacting turbochargers that operate with far greater efficiency at lower engine speeds, reach maximum turbine speed in half the time of the previous units.